« Day 91 – Lysa S.
Day 92 – Carlos C.
I have been inundated with emails, comments, requests to follow me on twitter and requests to be a fan of the Facebook Page. People have written to me telling me that the Year of Giving project brought them to tears! I am speechless and so appreciative of the support that I have received from so many of you! Earlier this week I met Carlos at the Eastern Market. Carlos is the person I gave money to on one of the days that Susan Kinzie tagged along with me. He has been working at the family run butcher shop for 18 years…since he was 10! He used to cook samples for hungry patrons when he was a kid. Carlos is very knowledgeable about the meats that they have…showing me the pork from Pennsylvania and Virginia and the beef from various parts of the US and Canada. “You want to look for good marbling in the meat…like little ‘lightening bolts’” he tells me. Filet mignon is his favorite! Rather than me write more about Carlos…go read Susan’s wonderful article! It’s apparently the most read article from Friday’s edition! Amazing. 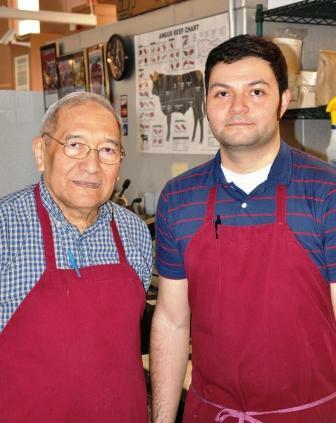 Go say hello to Carlos and his father Emilio at Canales Quality Meats at Eastern Market! Wow…that is great! Thanks Calin for saying hello and glad that you have enjoyed the Year of Giving. Multumesc! I will update the Statistics page this week and will be certain to include Romania! Congratulations Reed on the responses you’ve received! I’m really sorry to hear the loss of your cousin (and the craziness you went through in the last 48 hrs). Hope you’ll try to get some rest this weekend! Sorry to hear about your cousin. Love to hear your stories from each day. Thanks for the video. You blow my mind! May God bless you and hold you in His loving hand, while you continue to honor Him. You truly have found your mission on this earth my friend! The people you touch, will have a ripple effect long after you are gone. What you are doing is humbling. Giving every day…it is harder than it sounds. Thank you for your beautiful story and your beautiful practice. You are a light in our Washington, D.C., area. Diana, thanks for your interest. I am so happy that you actively practice giving in your life as well. It is extremely rewarding. Thanks also for your thoughtful letter to Ellen…who knows, maybe she will find it interesting…I mean her last name sounds pretty close to “generous”! Greetings from Detroit! FYI, I just read an article about your Year of Giving in yesterday’s The Chronicle of Philanthropy (online daily update). I too am a non-profit professional in transition (unemployed). I intend to share your story and the pay the inspiration and giving forward. Thank you for sharing your experiences with us and reminding us to be kind and self-less. No need to reply, get some rest! I also found your blog today, surprisingly not through the stories you posted, but through a link on a smaller site. Would you mind if I posted about this on my blog? I think it’s a wonderful project! Hi Tereza…glad you found the site…sounds like you were inspired…that’s the idea. Please, share on your blog. Hai dermawan, semoga karunia tuhan untukmu.. Setelah aku membaca surat kabar jawa pos indonesia aku berinisiatif mengunjungi situsmu dan berharap kamu mau menolong aku. Dulu waktu usahaku masih sukses aku juga sepertimu,tiap hari minggu aku membagi uang kepada yang membutuhkan,tapi setelah badai krisis global 2009 bisnisku hancur dan aku jatuh miskin dan hutangku banyak pada salah satu bank di daerahku. Melalui tulisan ini aku berharap kamu mau menolong aku dengan membantuku dalam upayaku melunasi hutangku. Terima kasih atas perhatiannya dan semoga tuhan memberkatimu dalam kedamaian. Salam damai dari indonesia..